Chatbots are here to stay. Here are 4 reasons why. 1. Lack of expectations between what chatbots can do and what users expect (or in other words, bad user experience). This leads to an instant disappointment and therefore to low usability. It starts with the largest bots such as Siri and all the way down to the basic ones, which confuse users about their actual capabilities. 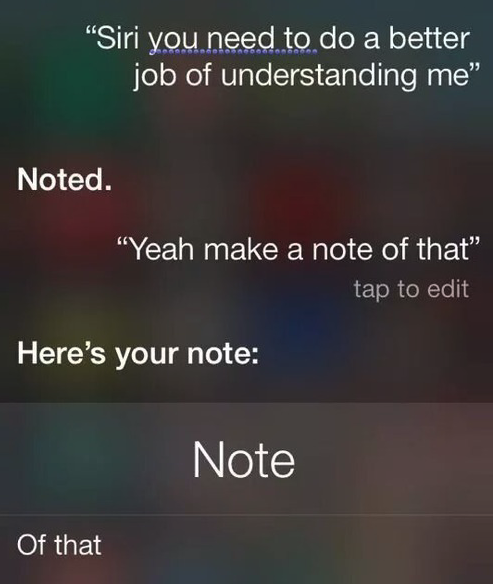 In theory, Siri claims she can do almost anything related to your iPhone device, calendar, and other internal Apple apps. In reality, over 60% of what you ask Siri is not understood or results in general web search results. Just so you can get an idea of what she can do, here’s a list of Siri commands. Did you know she can do most of it? I didn’t before. 2. The need to educate users on creating new habits. The last bot I’ve built was focused purely on the conversation and therefore did not have any buttons or menus. Retention was low, despite the fact that most of the conversations between the bot and users were held successfully. What I’ve discovered, was that the more buttons and menus I added, the more retention grew. Swelly is a great example for successful bots with minimum conversation and maximum buttons. This behavior led me to the conclusion that the majority of users are still not used to talking with machines naturally, but rather prefer to click on buttons as we’ve been used to for the past 30 years. Secondly, clicking buttons is faster than typing sentences. However, buttons are not faster than voice, which is why I believe voice will eventually dominate the bot space. The transition from buttons to a natural conversation is growing but is still in its early adoption stage. 3. Artificial intelligence might have improved, but is still in its infancy stages. The reason this last and not first is because I truly believe we can build great chatbots with today’s current AI solutions (such as Api.ai, Wit.ai, etc.) if bots were more focused on how to create user habits and to offer a well-designed user experience that meets user expectations. You can read more about how to do this in a previous post I’ve written on how to improve your chatbot with 3 simple steps. Apparently, AI will only improve with time as more and more data is collected and trained across a multitude of domains. If you think about it, we’ve learned over the past 30 years to adjust ourselves to the complexity and limitations of machines. This adjustment has made via websites, applications, buttons, icons, etc. But in my opinion, the optimal scenario should be just the opposite — Machines should be able to adjust themselves to us humans, both from a natural language understanding perspective and personalization. Humans should be able to ask a machine anything naturally, instead of having to learn new interfaces, products, and habits for every service they need. For example, let’s say you’d like to know the weather. Until recently, you’d have to find and pick a service of your choice out of many alternatives and learn how to use it functionally. Now, since every service tries to be innovative and different from its alternatives, this usually results in various UX/UI which means more learning and effort required by users. The optimal solution would be if you could just ask. Thankfully there are many great solutions today for weather assistants (such as Siri or Poncho), and there are much more to come in other domains. Not very long ago, companies built virtual assistants who tried to go very wide and open but quickly realized how hard it is to understand natural language. Going back to Siri’s example, Apple sought to capture many domains to display Siri as the ultimate personal assistant. This ambition failed very quickly. On the other hand, AI solutions that have succeeded, are the ones that focus narrowly on one specific domain. Take for example Getdango — an AI solution for predicting emojis. They’re doing a great job predicting emojis based on natural language, and it’s due to their narrow focus. Another example is Meekan, a scheduling assistant for teams on Slack. Meekan is a chatbot dedicated to providing the best solution for scheduling events as easily as possible. The power of synergy where individual bots focus on specific domains is the right approach for solving bigger AI challenges. You can see companies moving in this direction like FB Messenger’s latest release of handover protocol which enables two or more applications to collaborate. More importantly, Amazon partnered with Microsoft to collaborate on Alexa with the help of Cortana to provide a more powerful virtual assistant. If every bot were to focus on one specific domain, the race to AI in a whole would be solved faster and more efficiently. Happily, that’s where we’re heading. The way most products are designed today is to maximize immediate short term value for users once they enter an application. While the web and mobile applications focus on short term value, bots can and should focus on long term value. Bot developers should focus on how to build relationships with users over time so that value is gained and grows continuously with every single interaction. With time, bots should know enough about what they need, to maximize and personalize the user experience and minimize input friction. For example, say you’re looking for a travel planning service. The way you would go by it today, is to look at travel sites, fill the proper forms, and teach the site about your preferences and filters every single time. The way a bot should work is to know which information is relevant to learn about the user, like personal information, preferences, budgets, places the user has already been to and etc. Bots should constantly learn from user’s behavior and offer much more personalized responses. The bot should know by now how many people are in your family, their ages, where you’ve already been to, where you’re at right now, what you like to do, what you don’t like and much more. 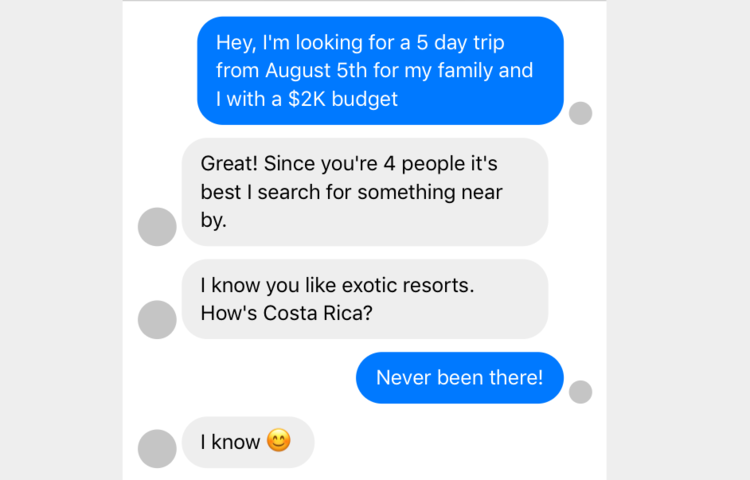 In other words, the bot shouldn’t be any different from a real travel agent. To see how much are users willing to share regarding their personal information within a conversation, I’ve researched with one of my bots. The bot started asking users basic questions like “how old are you” all the way to more personal questions like “what are you most insecure about?”. Guess how many of total users answered all questions truthfully?… Over 85%. More specifically, 89% of women answered all questions truthfully, while “only” 81% of men answered all questions. So if you’re a bot developer, don’t be worried about users not sharing their information. Worry about what questions you should be asking to enhance the users long term value. This kind of information retrieval is something today’s applications cannot achieve, and where chatbots have a huge advantage. In just a few years, mobile apps have transformed to must-haves for smartphone users. But despite the increase in app usage and app choices, the number of apps used per user is staying the same, according to a recent report from Nielsen. Most people are tired of downloading mobile apps and learning about how to use new interfaces. Also, research says that US citizens own in average 3.6 connected devices. These devices can vary from mobile devices to Smart TVs and products like Amazon Alexa. That’s a lot of connected devices! Now obviously, users would like to interact with your service on any device they’re using. But what do you do? Build an application for iOS, Android, Smart TV, Alexa, Smart watch, iPad, Windows and Mac and more? Sounds like a lot of work. And it’s going to be very hard for you to get users to download your app in the first place since they’re already flooded with other apps. This ever growing challenge is where the beauty of messaging platforms comes in. At present, approximately 75% of all smartphone users use some of messaging apps such as WhatsApp, WeChat, Facebook Messenger, etc. Over 1.2 billion people worldwide have and use Messenger on their devices, all people that have mobile devices have SMS and obviously, most have an email account. The list goes on. Instead of building applications and spending hundreds of thousands of dollars, just focus on building your bots back end. For the front end, just integrate your bot across multiple messaging platforms that are already on users devices, and you’re set. If your service brings value, users will come. More importantly, turns out it’s what users want. The future and success of chatbots depend not only on the big 4 tech companies but on developers and entrepreneurs who continue to innovate and push boundaries in AI and conversational interfaces. Most of the current mistakes in this sectors are tomorrows improvements and solutions. Eventually, bots will bring great value that cannot be achieved with today’s applications. To learn more about chatbots go ahead and read the chatbots beginners guide. If you want to start building one, read this post on how to develop a Facebook Messenger bot.